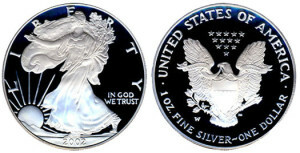 This page will cover the 1998 through 2003 releases of American Silver Eagles, and provide information about each edition of the coin. This year was the start of an increased demand and mintage of the American Silver Eagle coin series. This 1998 American Silver Eagle coin boasted a higher production of coins being driven by the rising price of silver. Silver’s per ounce price rose steeply and then dropped, but its initial increase allowed for this 1998 American Silver Eagle coin to pick up the production over previous years. This increase is a precursor to the high demands instigated over the next few years that were fueled by the impending Y2K crisis possibility. 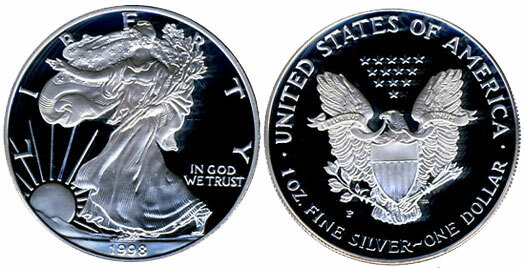 The US Mint also provided the 1998 American Silver Eagle’s bullion version as a proof for collectors and dealers. In keeping with the US Mint’s exquisite marksmanship, the proof featured a high quality finish with cameo contrast. These proofs were minted at the US Mint’s facility in Philadelphia with a maximum authorized production amount of 450,000 coins. The coins were priced at $24.00 each, an increase from the 1997 price of $23.00, and all 450,000 coins were sold. This very first price increase for these coins in this American Silver Eagle series was back in 1987. The per ounce price of Silver started 1998 at $5.80 per ounce and increased dramatically to $7.81 in the beginning of February. By the middle of 1998, silver prices dropped back close to $5.00 per ounce where it remained. The price of silver in 1998 averaged $5.55 per ounce. In 1999, with the uncertainty of Y2K looming over businesses, minting of the American Silver Eagle coin was increased to the highest level in years. There was a high demand for precious metals and although the buying was focused on Gold Eagle bullion, the Silver Eagle bullion coins saw a matched level of sales. The need to mint 1999 American Silver Eagle bullion reached the maximum level since 1987 when minting rose close to 7.5 million. 1999 American Silver Eagle coins were of course, made available for collectors and each coin was created with an exemplarily high quality cameo proof finish. The US Mint produced a limited number of 550,000 coins. Each 1999 Proof Silver Eagle was priced at $24.00 and the entire mintage was sold out with the final number being slightly lower due to adjustments. Although there were increased numbers of this coin minted for 1999, collectors will have a difficult time locating certified coins with a perfect grade proof in PCGS and NGC. If searching for MS-70 grade coins, collectors will encounter a difficult search when inquiring with NGC holders and PCGS holders do not have these 1999 American Silver Eagle coins. During 1999, silver was traded for anywhere between $4.90 an ounce up to $5.70 an ounce and the overall average price of silver this year was $5.22 per ounce. Although the threat of Y2K was over, minting for the 2000 American Silver Eagle increased as interest in precious metals remained at the forefront. Mintage for this coin reached numbers over 9 million, which not only rose above previous year’s mintage, but almost passed the record 1987 mintage levels. The United States Mint began offering this 2000 American Silver Eagle’s proof on May 15, 2000. With the coins being touted as “the perfect collector’s item to commemorate the year 2000,” full maximum mintage saw a sellout of the maximum mintage allowed—600,000. These 2000 American Silver Eagle coins were priced at $24.00. Also in 2000, the Millennium Coinage and Currency set was available by the US Mint as a separate offering. Included in this unique set were the Sacagawea Dollar, just recently introduced, an American Silver Eagle coin, and one dollar bill, each with a unique serial number. When collectors realized the Sacagawea Dollar appeared as a unique burnished finish, all 75,000 units sold out. 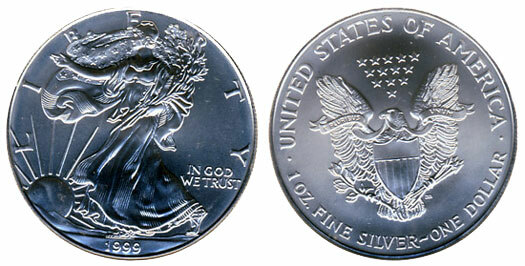 Third party grading services also labeled the Silver Eagle coin in this set as being part of a Millennium Set. NGC holders will provide certified coin collectors with perfect graded proofs, but locating the PCGS PR70DCAM will be difficult. PCGS has not graded the 2000 American Silver Eagles. Silver averaged $4.95 per ounce in 2000. In previous years, the sales of this American Silver Eagle coin reached historic levels, but the American Silver Eagle coin met a lower level of sales in 2001. The bullion mintage for this coin in 2001 remained at a historic high as more than 9 million coins were minted. The U.S. Mint decided to also offer the 2001 American Silver Eagle in a collectible proof version meant for collectors and so the 2001 proof coin was made available for sale in April of that year. The U.S. Mint priced this coin at $24.00 and limited the mintage amount to 750,000. In 2001, the U.S. Mint changed the location for minting these American Silver Eagle coins from its historic location in Philadelphia to the mint at West Point. Coins minted at West Point were marked with a “W” indicating production at West Point. In 2001, the price of silver held at an average rate of $4.37 per ounce. In 2002, the American Silver Eagle coins were minted by an increase of 1.5 million over 2001. With this robust amount of coins produced, the total mintage of these coins reached a level over 10 million for the first time since 15 years prior. Although promising, this amount of minted American Silver Eagle coins would not reach these levels again for another four years. The US Mint provided these coins for sale beginning on June 5, 2002 as collectable proofs. This mintage was numbered at 750,000; the maximum allowed for this coin. The 2002 American Silver Eagles were priced at $24.00 and as in 2001, the coins were minted at the West Point Mint and again bore the infamous ”W” designating West Point production. Although promising, the West Point Mint did not sell all the coins and the final tally was 647,342. When certified collectors seek the perfect grade proofs of this coin, the NGC PF70 Ultra Cameo and PCGS PR70DCAM provides an abundant number to purchase from. The NGC MS 70 has many of these perfect grade proofs, but they have not been graded by PCGS. In 2002, silver actually traded in a narrow monetary amount of $4.40 per ounce to $5.10 per ounce and the average price throughout 2002 was $4.60 per ounce. 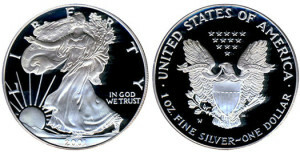 In 2003, the American Silver Eagle coin mintage saw a decrease by more than 2 million coins produced compared to the production amounts in 2002. Over the next 2 years, these coins were produced at 8 million and remained there until the demand started a more substantial increase. The 2003 American Silver Eagle proof was offered to collectors on April 2, 2003 by the US Mint. 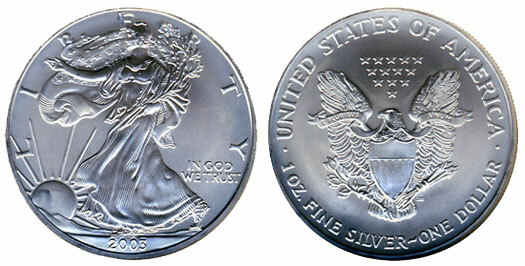 As in previous years, this 2003 American Silver Eagle proof was priced at $24.00. Although the maximum mintage allowed by the US Mint was set at 750,000 as in 2002, the US Mint sold 747,831 coins. In previous years, these American Silver Eagle coin’s perfectly graded proofs were difficult to locate within the NGC PF 70 Ultra Cameo and PCGS PR70DCAM, but these 2003 American Silver Eagle coins are much more available to collectors. Although the NGC MS-70 will have readily available perfect graded bullion 2003 coins, they have not been graded at this designation by PCGS. Silver was priced at an average of $4.88 an ounce in 2003, and increased at a steady rate until the final quarter of the year when it reached a peak of almost $6.00 per ounce.